Whistler 3 is your luxury spacious tastefully appointed townhome for those who want the best accommodation when on holiday. The owners have had years of experience in holiday rental properties. They recognise what is important to make your holiday accommodation live up to your expectations. They are constantly updating and improving the property with touches to make you feel at home. This holiday home is great for a family gathering. Due to bedding configurations it is not suitable for groups. Your view encompasses a180 degree vista of the Snowy Mountains. 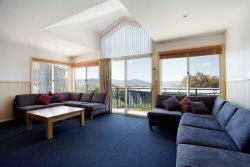 You will gaze out over 25klms to the northern reaches of beautiful Lake Jindabyne. To the left are the Snowy Mountains rising out of the Lake to the ski resorts of Thredbo and Perisher Valley. Enjoy this magical moment with a glass of local wine and sizzling steak straight off Whistler's bar-b-que. Inside, a gourmet kitchen, outfitted with high-end appliances including a built-in refrigerator and gas stove, offers views of its own. For indoor dining, the formal dining area is situated in the open space between the kitchen and lounge room, where a comfortable sectional sofa invites you to enjoy a movie after a day in the mountains or watch your favorite game on the large, flat screen television. There is cooling or warming air conditioning in the upstairs living areas. Warm under floor heating will make your holiday that little bit nicer. Four comfortable bedrooms, one with their own en-suite, provide the perfect accommodations for large families or friends traveling together. Two of the bedrooms feature sliding doors and personal access to the veranda. There are two bedrooms on the main living floor and a further 2 located downstairs. All King Beds can be split to make long singles. Ideally within a stroll to Jindabyne, restaurants and shops. Although you’ll feel miles away, you’re just a short 5 minute drive to the best restaurants, shops and galleries of Jindabyne. You can browse the ski shops and book a tour or lessons in both winter or summer months. Vehicles are accommodated in the insulated direct access, double garage that includes ski storage with attached drying cupboard for any wet articles. There is no parking available for mini buses. Whistler 3 is one of our most requested properties with families returning year after year for their holiday. The property also comes with FREE WiFi for your visit. Full sized refrigerator with Freezer. Nescafe Dolce Gusto Coffee Machine)- BYO your favorite blend and No, George Clooney will not serve you coffee! Fantastic company to deal with. Whistler is perfect for a family get away. It has everything you need with a stylish decor. Ray White Jindabyne with Joan and Peter are the best to deal with for any holiday. I have booked with them before and will continue to do so! Whistler 3 has plenty of room for a family or small group. The kitchen has everything you will need and the beds are some of the most comfy I have ever slept in. The linen and towels are 1st class. We especially appreciated the ease of getting in to the unit through the garage without getting wet! We always stay with Joan at Ray White when we travel for training camps. Second year at Whistler and great same as last year. Best accommodation we stay in around the world! Ray White go above and beyond for their guests. Cannot fault their service or knowledge of the area. Always willing to help when needed. Just stay here! Probably the best holiday house in Jindabyne. Close to the main road to the mountains and an easy 15 minute walk to shops. Drying room and heating much appreciated. The whole family could access the WiFi with good speeds. Peter and Joan were delightful to deal with - incredibly knowledgeable, responsive, and communication was always very clear. Their warm hospitality far exceeded my expectations for any property managers. As shared on Airbnb - This beautiful townhome exceeded our every expectation for a family reunion at the snow. Aside from the stunning views and design that made the property a perfect winter retreat, we were also impressed by the thoughtful details that took care of our every comfort. Peter and Joan's warm hospitality and incredible responsiveness and understanding when we had to get in touch out-of-hours was much appreciated! You are always a little nervous when you first book with a new agent but Joan & Peter and their staff made everything like we were coming to another member of our families home! Small things like a welcome bag from their daughter and a personal phone call before we arrived made all the difference. I recommend them to anyone who wants to book a holiday in Jindabyne or Thredbo. We chose Whistler 3 as we had 2 families coming. The unit is spacious enough for everyone to have their own space but we could all get together a meal times. The kitchen had everything you would need and the views from the upstairs are sensational. We can't wait to come back again next year. Lovely staff and I look forward to staying at your property again in the near future. Whistler 3 was comfort in the blistering cold. We'd shortlisted seven properties and I'm so glad we chose this one. The underfloor heating was amazingly good, I didn't even need to wear the multiple layers I'd packed. This is a beautiful house for a weekend away in Jindabyne. Very close to the stores and local attractions with stunning views of the lake! Very happy with Ray White service. Great Ray White Team!Excellent service and friendly staff. Easy booking and great information provided on check in. Great stay in Whistler 3 and we will book again next year! Friendly and very clear about the expectations. Had an absolute blast here. What a great place. Had a great time, very informative and excellent service all round! Excellent location with amazing views and the local brewery across the road. Checkin was straight forward, the house had everything we needed and more. Would come back again. Love booking with Peter, Joan & family. We're return customers, who will be back again. Had a great week in the snow, with family & friends. Couldn't have been better. Lovely team of people whom I am happy to deal with again next year. Had a wonderful time at the snow. Very friendly and helpful staff- Peter was our host and he is super friendly - would definitely recommend! Thanks for making every step as simple and convenient as possible! We really enjoyed the stay and will definitely come back when we visit Jindabyne again. This placed managed by Peter was great ! Would definitely rent it again if visiting Jindabyne and surroundings. Very clean and tidy as expected and the kitchen was very well equipped. Love the view of the lake from balcony. Would definitely rent it again if visiting Jindabyne and surroundings. Joan and Peter do a great job of welcoming their guests. I would recomend them to anyone who is thinking of booking a holiday in Jindabyne. Peter was an excellent host. He made sure that we were kept well informed of everything and answered our questions promptly - a very nice gentleman. Thanks again Peter! The accommodation was perfect for our party of 8 adults and 2 kids. The place was kept clean and in excellent condition. There was plenty of space in each room, including the bathrooms and showers. Great location to be overlooking the lake! The shops were also close by. Overall, the place was above our expectations. We had absolutely no complaints and enjoyed our stay very much. We definitely recommend this place and will be coming back here again! Had a perfect weekend getaway, the house was cosy and everything you need. Highly recommend !